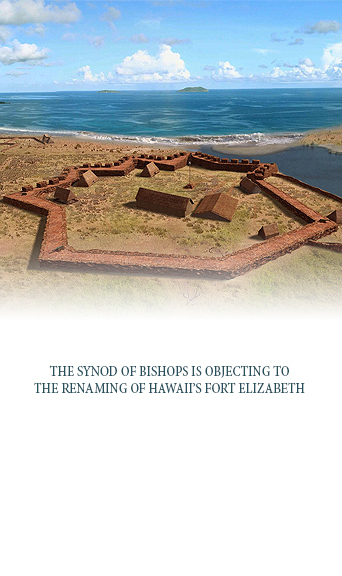 On Thursday morning, December 6, 2018, during an expanded session of the Synod of Bishops of the Russian Orthodox Church Outside of Russia, a proposal made by His Eminence Archbishop Kyrill of San Francisco and Western America on sending a letter of protest against renaming the Russian Fort Elizabeth, Hawaii, was heard. As reported by San Francisco’s Russkaya zhizn’ [Russian Life] newspaper (No. 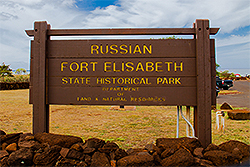 14470), this massive octagonal stone structure known as the Russian Elizabeth Fortress, is located on the Island of Kauai’i. It is the most impressive example of the Russian influence on the Hawaiian Islands of the early 19th century, and the acquisition of this island by Russian mariners. Russians landed on this island in peace, bringing new building technology, medicine and farming expertise. 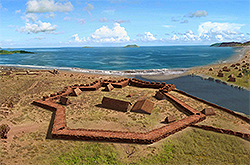 Recently, a group of Hawaiian activists and the representatives of a historical society in Kauai’I initiated a movement to rename the fortress, which was named after the August Spouse of Emperor Alexander I. They are pressuring the landmarks’ administration and the island’s government to erase the Russian legacy from the Hawaiian Islands. Riding the wave of Russophobia, they began a campaign on the assertion that the fortress was built by local natives and had no relation to the Russian presence. Last year, at an history forum devoted to Elizabeth Fortress, clergymen of the Parish of the Iveron Icon of the Mother of God of the Russian Orthodox Church Outside of Russia and other Orthodox Churches of the island performed a memorial service, attended by local authorities, historians, social activists and many Russian Orthodox Christians of the Hawaiian Islands. Exhaustively examining this situation, the Synod of Bishops unanimously decided to write a letter of protest against the renaming of the Russian fortress. The Congress of Russian Americans drafted a petition calling upon all Russian people to sign it. Archbishop Kyrill instructed the petition to be distributed to all the parishes and monasteries of the Western American Diocese.